(L to R): Contra Costa County Supervisor John Gioia, Contra Costa County Board Chair-Supervisor Karen Mitchoff, Award Winner-Contra Costa County Administrative Officer, David J. Twa, Contra Costa County Chief Assistant Clerk of the Board and Senior Deputy County Administrator Jami Napier, Contra Costa County Public Works Director Brian Balbas, Contra Costa County Public Works Deputy Director Warren Lai, and Contra Costa County Public Works Chief Deputy Director Stephen Kowalewski. Martinez, CA – Contra Costa County announced today that County Administrator, David J. Twa, won statewide recognition with the 2018 Distinguished Service Award from the California Association of County Executives (CACE). 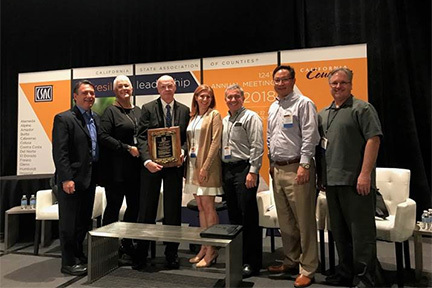 The prestigious award was presented at the General Assembly of the California State Association of Counties Conference this past week in San Diego. The top award for County Administrator or County Executive for Distinguished Service is only handed out for truly outstanding and meritorious work. The annual award is given to an individual CAO or CEO who has demonstrated respected leadership, shown exemplary work to benefit the community through long term positive results, and serves as a role model for others in cities, counties and the state. “David Twa is an excellent choice to be recognized by CACE in 2018 for his distinguished service and work on behalf of all counties in California. He has represented counties on many critical issues and mentored many county leaders throughout the state,” said Birgitta E. Corsello, Solano County Administrator and current President of CACE. County Administrator David J. Twa was recognized with a similar award for his CAO accomplishments in Minnesota where he served in multiple counties before coming to California. He was appointed to his current role in Contra Costa in 2008, and is responsible for the overall administration of County government. He holds two Bachelor’s Degrees, one in Political Science from the University of Minnesota, Minneapolis, MN, and the other in Accounting from Minnesota State University, Mankato, MN. He holds a Certificate as a CPA. Mr. Twa received his Juris Doctorate from the University of Minnesota Law School in Minneapolis, MN. Prior roles include serving as County Prosecutor and the Elected County Attorney in Minnesota. He currently serves on multiple committees and associations, including the California State Controller’s Office Advisory Committee on County Accounting Procedures, the Executive Committee for East Bay Economic Development Association, and the East Bay Regional Community System Authority (EBRCSA) Joint Powers Authority of Alameda and Contra Costa Counties, and 30+ Cities providing Regional Communication Channels for Emergency Services.